High capacity all frozen food vending machine or fresh food/frozen food combination vending machine with a small footprint. Vends up to 36 products with custom product configuration available. ADA ready. The Combi 3000 features next generation air flow architecture allowing it to dispense refrigerated AND frozen foods from the same machine using a common delivery fall space. The Alpine Combi 3000 can be financed through the factory’s in-house finance company, USI/Inland Finance, with zero down payment and up to 36 monthly payments of $246.64. Net 30 terms as well as a ninety day interest free financing is also available. 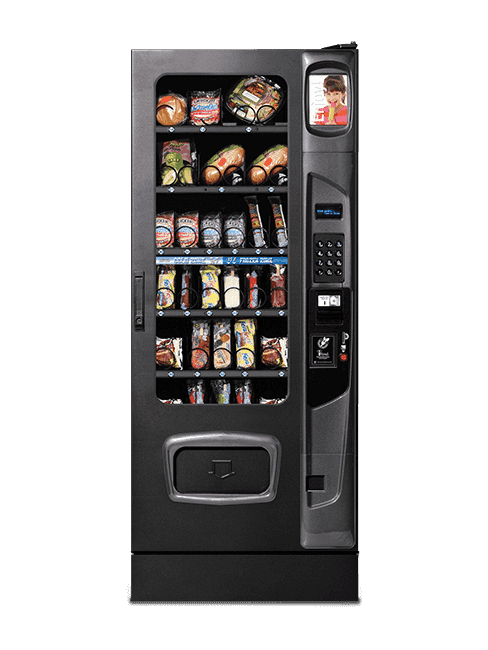 The price of the vending machine includes coin mechanism and bill acceptor and is credit card compatible. There is a two year parts warranty on all parts. Two machines in one. Refrigerated foods, including sandwiches and salads, as well as microwaveable frozen foods and ice cream. High capacity with up to 540 items. Glass front design reduces shopping and provides always full appearance. LED lighting enhances product presentation and reduces lighting energy costs by 73% over fluorescent equipped models. Convertible in the field to fully frozen or fully refrigerated. Motoring pairing capable for vending wide food entrees.